Wauseon Lions Club members Judy Smith and Scott Brubaker, far right, presented a plaque to Wauseon’s boys and girls basketball teams for their contribution to diabetes research. A fundraising basketball game the district held in November collected $1,153. Also pictured, from left, are WHS Assistant Principal Ryan O’Dell and Principal Keith Leatherman, and BOE Vice President Larry Fruth. The Wauseon Board of Education on Monday approved a plethora of staff contracts, most for the 2019-20 school year. But the meeting began with Wauseon Lion’s Club members Jerry and Judy Smith and Scott Brubaker presenting the school district with a plaque commemorating the boys and girls basketball teams “in recognition of significant contributions to research into causes and cures for diabetes.” A fundraising basketball game held in November allowed the city’s Lion’s Club to raise $1,153 for diabetes research. A one-year limited classified contract for MacKenzie Robison as a six-hour high school sweeper for the remainder of the school year; continuing contracts to employees Michelle Borton, Sara Brown, Melanie Johnson, Mary Norman, Carla Richer, Jenna Storrer, Kyle Storrer, Michelle Winters, Hope Wood, and Tatiana Wright; one-year limited certificated contracts to Tiffany Anderson, Joy Beck, Bridget Benedict, Christina Bergman, Jaz Bluhm, Samantha Burkholder, Sarah Burkholder, Mallory Carroll, Christian Crew, Hannah Dymarkowski, Shayla Hayes, Lauren Martinez, Abbie Mathews, Kristin Sayers, Casey Smith, Kaitlin Szozda, James Vaughn, and Brenda Wagner; two-year certificated contracts to Tina Blanchong, Derek Eddings, Victoria Hanson, Allison Hilton, Stephanie King, Shawn Moore, Brittany Schroeder, Rebecca Stuckey, Laura Vorwerk, and Brittany Webster; one-year limited supplemental contracts for extended time to Katie Black, Samantha Burkholder, Jessica Gerig, Laura Leininger, Kaitlin Szozda, Chris Thomas, Laura Vorwerk, and Terri Westfall. Classified contracts to Lauren Borton, Michelle Cantu, Cindy Henson, Lisa Kudlica, and Eric Sauber; a one-year limited classified contract to Dawn Kauffman; two-year limited classified contracts to Cortney Badenhop, Erin Cheesbro, Stephanie Duvall, Tiffany Emery, Sabrina Hartson, Melanie Hoot, April Jackson, Susan Morgan, Gwen Murry, Karen Rees, MacKenzie Robison, Barbara Silveous, Bethann Simon, Laurie vonSeggern, Kayla Wyse, and Amber Zuidema. One-year limited athletic supplemental contracts to: Joe Allen, head cross country coach; Tiffany Anderson, seventh grade volleyball coach; Cortney Badenhop, fall and winter high school cheerleading coach; Shelly Borton, assistant varsity girls basketball coach; Ken Bradndon, ninth grade football coach; Mark Britsch, head golf coach; Tom Burkholder, diving coach and aqautics director; Chad Burt, head boys basketball coach; Charles Carr, head girls bowling coach; Brice Carroll, seventh grade girls basketball coach; Sydney Chamberlain, assistant varsity volleyball coach; James Douglass, seventh grade boys basketball coach; Casey Elson, head boys soccer coach; Tracey Elson, assistant varsity boys soccer coach; Troy Gype, ninth grade boys basketball coach; Joe Henson, eighth grade girls basketball coach; Stacie Kessler, assistant fall and winter high school cheerleading coach; Matt Lane, ninth grade football coach; Sarah Leininger, fall and winter middle school cheerleading coach; Terry Lind, assistant varsity football coach and junior high wrestling coach; Shawn Machacek, junior varsity girls basketball coach; Kody Moden, head girls tennis coach and head boys bowling coach; Mike Ritter, head wrestling coach; Dan Seiler, head girls basketball coach; JD Schnitkey, assistant varsity football coach; Brandon Schroeder, head girls soccer coach; Brittany Schroeder, assistant varsity swimming coach; Tony Schuette, head swimming coach; Jordan Smith, assistant varsity wrestling coach; Sam Smith, seventh grade football coach; David Storrer, assistant varsity boys basketball coach; Kyle Storrer, junior varsity boys basketball coach; Trent Thomas, assistant varsity football coach; Joe Torres, junior high wrestling coach; Nick Tule, ninth grade football coach; Tom Vernot, assistant cross country coach; Michael Webster, assistant varsity football coach and eighth grade boys basketball coach; Roger Wilson, seventh grade football coach; Todd Wyse, eighth grade football coach. One-year limited non-athletic supplemental contracts to: Adam Baird, high school Spanish Club and Quiz Bowl; Katie Black, FFA; Jaz Bluhm, assistant instrumental; Don Clark, orchestra director, instrumental ensembles, and stage crew manager/advisor; Mike Colon, high school Art Club; Mark Cook, assistant instrumental specialist; Michelle Eberle, primary school LPDC; Ambery Fryzel, middle school LPDC; Kim Hinton, middle school Quiz Bowl; Joy Hutchinson, middle school Student Council; Jana Leininger, junior class advisor; Laura Leininger, FCCLA; Katie Miller, high school Student Council; Dolores Muller, Speech Team; Ami Richer, high school LPDC; Jason Robinson, Mock Trial, fall play director, spring musical director; Jenna Storrer, Girls Christian Fellowship; Rebecca Stuckey, high school Student Council; Chris Thomas, FFA; James Vaughn, vocal ensembles and spring musical assistant; Sheila Vernot, district mentor coordinator; Laura Vorwerk, National Honor Society; Jill Welch, elementary school LPDC; Terri Westfall, junior class advisor; Tatiana Wright, high school Spanish Club. A one-year limited outside athletic supplemental contract was offered to Noah Parsons as eighth grade football coach, pending a clean background check. Volunteer coaches for the 2019-20 school year are Kyle Borton, assistant girls basketball coach; Ray Martinez, assistant boys basketball coach and assistant football coach; and Saul Triana, assistant football coach. Ryan Parsons was approved as volunteer assistant junior high football coach for 2019-20 pending a clean background check. In other business, donations accepted for the school district included: $100 from William and Marlo Hanak to the Joseph E. Sevenich “Step on the Starter” scholarship fund; a total of $2,000 from the Wauseon Rotary Club to the high school, middle school, and elementary school, respectively, for their student activity accounts; $500 from Sonit Systems on behalf of Brenda Farnsworth to the elementary school food pantry; $126.29 from Christ United Methodist Church to the school district for after school snacks in February; $126.25 from Wauseon Education Association to the elementary school food pantry; $785 from Parents Supporting Schools to the primary school for K Awards and Right to Read Week items. The board approved a motion to allow Parents Supporting Schools, the Wauseon After-Prom Committee, the Wauseon Athletic Boosters, and the Wauseon Music Boosters to each purchase liability insurance at $70 under the school program, effective, July 1, 2019, to June 30, 2020. 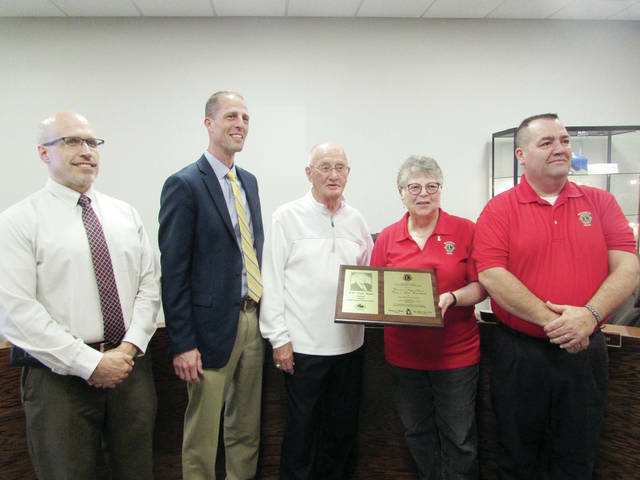 Board members also approved: an overnight trip for FFA members to attend the state convention May 2-3 in Columbus; a Board of Education/Governing Board resolution authorizing membership to the Ohio High School Athletic Association for the 2019-20 school year; and a motion to approve NEOLA bylaw policy revisions; and a motion to approve one-year land lease contracts with Larry Zimmerman and Jo Ann Parker, for 31 acres at $175 per acre, to be used by Wauseon Agriculture Education classes. • Theresa Vietmeier, elementary school principal, said scheduling for the 2019-20 school year will include significant changes. One is an increase in English/language arts time. • Middle school Reading/ELA testing is scheduled this week. The school’s spring dance will be held Friday, April 26. • The high school’s annual Senior Success Day will be held April 26. Students participate in a “game of life” simulation in which they experience numerous aspects of adult life. “They quickly are exposed to some things that they maybe haven’t thought about in terms of getting ready to step out into the real world,” said Principal Keith Leatherman. Both the Symphonic Band and A Capella Choir earned superior ratings and qualified for state competition. The National Honor Society inducted 39 members on Monday. The board entered executive session to discuss employment of personnel. No action was taken.